The other is that universal symbol of romance, the heart. This is largely Shakespeare's fault. His version of Romeo and Juliet may have been based on earlier writings, but it was he who made the play, creating the characters and the poetic language that can make something feel true even to people who know perfectly well it's not. 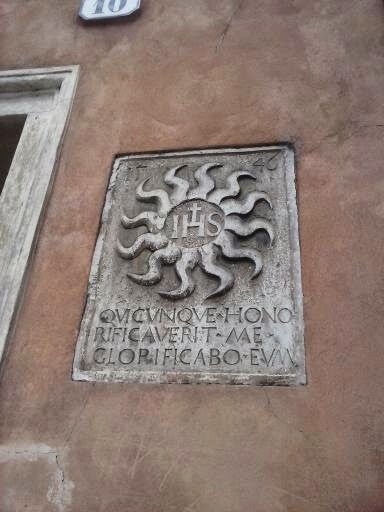 Like, for example, the crowd standing under Juliet's balcony in the Casa de Giulietta on Via Cappello. The balcony was not there in Shakespeare's time and the similarity of Capulet to Cappello is probably meaningless, but that's not the point - the point is the other people, the crowd itself, and the crowd that has been flowing in and out through the gates of the courtyard for years, writing on the boards fixed to the walls, pinning up post its, fastening locks around the metal gratings of the doors. It's that idea of being madly in love, so in love that nothing else in the world matters, that people truly come for. 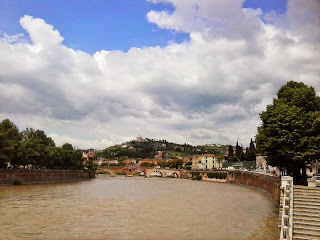 Verona itself can only add to that intoxication. This is a very, very pretty city. In the evenings it smells of jasmine and sings with calling, diving, swallows. The walls and tiles of the houses are made of the warm red brick we flatter ourselves our own houses are here (when in reality London clay is a miserable yellow brown) and many have frescoes, fading now to hints of pastel and gold. There are innumerable pavement cafes where you can linger as long as you like, delightful bridges over the shallow but fast flowing Adige, piazzas with fountains and statues everywhere, a city wall with decorative crenellations, and if you walk up one of the nearby hills - say to the Castel San Pietro - it's green and leafy and charming and the view is wonderful. It has a silly little gold train which winds around the streets for 5 euros per person, and shows you everything in half an hour, and that too is part of Verona's charm. It's small, even intimate. You could be 20, and skint, and walk everywhere and not go into a single museum or church or restaurant but still feel like you knew Verona, in a way you could never know Paris or London without spending money.